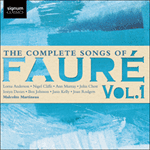 Fauré’s life took an easier turn in 1896 when he succeeded Massenet as a professor of composition at the Paris Conservatoire and even easier, from some points of view when he was appointed Director in 1905. But he took his duties in both posts very seriously and as Director took an especial interest in the teaching of singing. Between 1906 and 1916 he wrote at least 29 vocalises for the sight-singing examinations. These exercises, recently unearthed by Roy Howat and Emily Kilpatrick and edited by them for publication by Peters in 2014, range from the relatively simple to the decidedly taxing and, as the editors point out ‘With no phrasing marked in most of the manuscripts, sight-singing students had to use their wits and read ahead to judge and shape phrase lengths, particularly when Fauré prolongs a melody or suddenly transfers it up an octave just as it seems about to relax into a cadence.’ No 20, written for the women’s final examination on 12 June 1912, is an example of the simpler style, reminiscent of ‘Lydia’.